Trading and Investing Why is Dollar rising? The recent spike in $ is astronomical! The strength of the $ has shaken up all the emerging economies, commodities and other financial markets. For our economy, this means really big trouble. The above data shows the astronomical rise over the past 6 decades. And even the past 2 years have seen it rise from 44 to 66. But, it is not only our currency which is hit by this rise. Currencies of other emerging economies have taken a hit too! 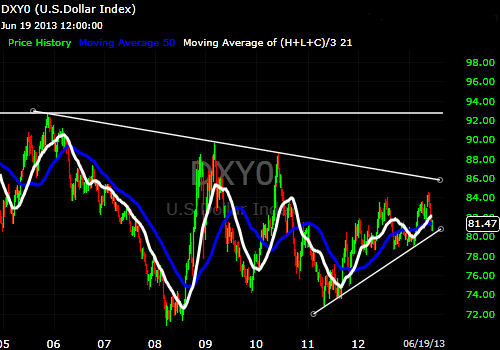 This is evident from the strength of the "Dollar Index". The chart of the dollar index shows the strength and its rise from 72 to 84 in the past 2 years. $ has out performed the dollar index when it compares to Rupee. Rupee has just weakened against dollar while over decades, the dollar index has actually fallen from levels of 165 in February 1985 to 82 (21st June, 2013) and in May, 2016 it trades around 96 levels! So, why is the $ rising? The revival of growth of the economy of USA has pushed up the dollar against emerging market economies as clouds of economic uncertainty over emerging markets makes the USA economy more attractive. Also, with interest rates increasing in USA due to FED's monetary policy, Rupee will be facing pressure against the dollar. US markets are near all time highs and most FII money pouring into India is diverted to the safer US markets where the opportunities are higher. India is still importing gold in huge quantities despite the hike in excise duties! This means more and more $ is needed to pay for this gold which is being imported. $ gets more dear and hence runs ahead. Also, gold has lost its shine in institutional investors as a safe asset. This title has passed on to $. What India has to pay in $ is far more than what it has to receive in $. The difference between the payable in foreign currency and the receivable in that foreign currency is termed as Current Account Deficit. As the government will need more $ to pay off their bills, once again $ gets more dear. 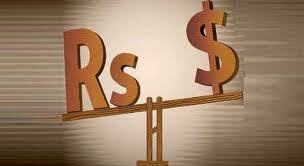 To support rupee, RBI has to sell $. And the absence of such moves from the open market shows that RBI is concerned about letting go of every $ it has in it's coffers as it can harm the current account deficit. India is one of the largest consumers of oil, and this demand is ever increasing. As more and more $ is required to cope up with the rising demands, once again we see $ getting more dear. People say the currency market is rigged and manipulated by the big investment banks and a lot of speculation in the currency derivatives market is the reason for this spike (10% in 20 days is no joke). The rising dollar is a very big reason of worry as it means that the imports become costlier, our fuel costs increase, our current account deficit widens and these all spark off a rise in inflation. India had seen some cool down in the inflation rates in the recent months and this good news could be short lived if dollar doesn't come down soon. Also, the companies which have debt raised in $ now face a big risk of higher interest payments. Also, imports for these companies will cost them more which will disrupt all budgets and plans. How to make money from this? BUY stocks in companies that are export oriented! But simple said than done. Our investment advisory services will help you find the best stocks to invest in and make money in the long run! unnessosory consomption of goods from MNCs also is leading to CAD cut un essential trips abrod heavily tax regular joly trips by cine actresses and rich,discourage film shooting in other countries encorage tourism by in frastrucure organised tours security to tourists food trave accomadation protection from bad eliments etc...to earn dollors.bring bach dollors hidden in swiss banks. The solution is simple. Stop importing oil from abroad and we should start using alternative fuels which can be produced within the country. Motor vehicles should use this fuel and not petrol and diesel. We need to cut down on our imports and produce the goods which we import within our country. Once we do this our Trade deficit amount will reduce. Problem solved.